Cross-country is fun! ... and: Cross-country is a thoroughly healthy form of exercise for people of all ages. 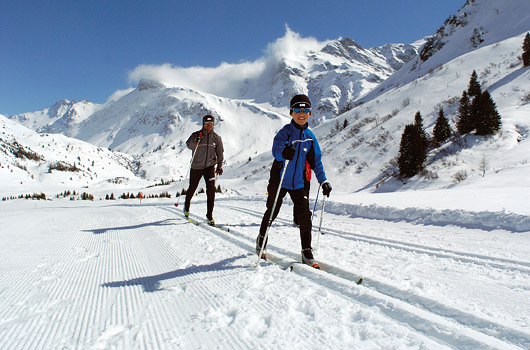 With over 90 kilometres of tracked and superbly groomed trails, Gastein is a paradise for cross-country skiers. Get away from the slopes and discover the most beautiful spots in the Gastein holiday region! In Sportgastein, skiers are drawn by the cross-country enjoyment promised by a high trail located at 1600 metres above sea level, guaranteeing great snow conditions until springtime. In the evening, the floodlit trail in Bad Gastein-Böckstein is certain to tempt you to squeeze in one last excursion before the day is done.